This exhibition has as its core a series of expressive canvases depicting the Pilbara region of WA but the show includes also a number of pieces of other more traditional rural landscapes. 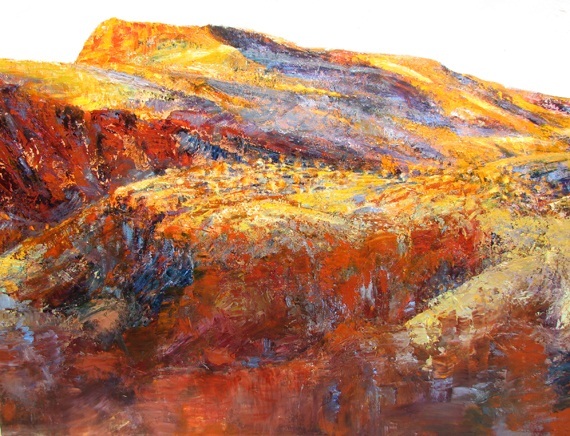 Examples of Anne Field’s work can be found at http://www.annefield.com.au/gallery/pilbara-and-wa.aspx. Red ochre earth, infinite terrain, the energy and power of the landscape are the themes of this exhibition, themes which are expressed in a poetic and painterly visual language. The intense and generous large canvases are supported by a number of smaller more distilled pieces. This exhibition is the first public airing for an emerging Australian landscape artist whose inspiration comes from direct experience of the Pilbara and rural WA. Captivated with the magnificent colours and forms of the WA landscape, the artist has expressed her deep appreciation on canvas. This exhibition is the result.